Project ICP partners Emily May, Rufus Isaacs, and Julianna Wilson (Michigan State University), have authored a Michigan State University Extension guide, “Minimizing Pesticide Risk to Bees in Fruit Crops,” which outlines pesticide risks to bees on fruit farms and suggests best management strategies to minimize these risks. 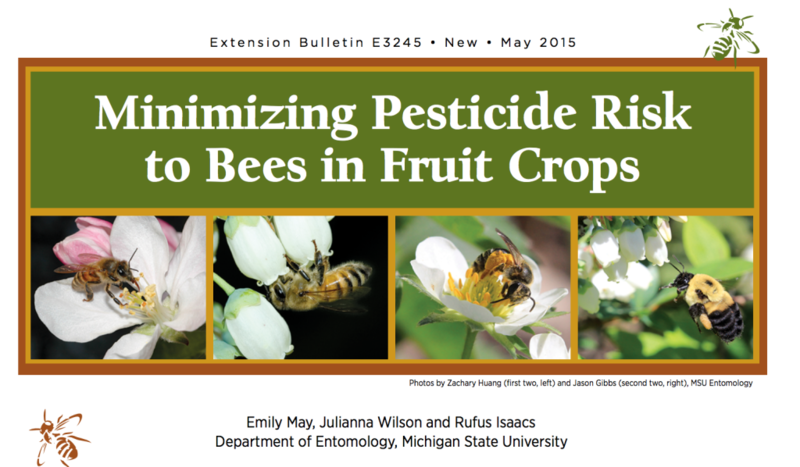 The document includes toxicity ranking tables for insecticides and fungicides registered in Michigan fruit crops to allow growers, extension educators and crop consultants to make informed decisions about pest management and bee protection. Develop and implement a pollination contract with your beekeeper. Use integrated pest management (IPM) to reduce the need for sprays. Avoid pesticide sprays during crop bloom. Apply pesticides after sunset or before sunrise, or when air temperature is below 50 degrees Fahrenheit. Select the least toxic pesticides and formulations when possible. Reduce drift onto areas outside crop fields. Remove flowering weeds from crops before spraying. Provide bee-friendly habitat away from crops. The guide is available from MSU Extension here.